If age spots and hyperpigmented areas are affecting the appearance of your skin, you may be a good candidate for fast, effective laser treatments. At Health and Rejuvenation Center in Miami, Dr. Aleida Hera offers this cutting-edge treatment to improve the appearance and condition of your skin affected by dark spots and discoloration. She uses the innovative ICON™ laser system to help you achieve younger-looking skin in just a few treatments. Schedule an appointment online or by phone to learn more about the benefits of dark spot removal. Areas of brown, black, or gray spots on your skin are common issues that occur as a natural part of the aging process, most often relating to years of exposure to the sun. These dark spots develop when your body produces an excess of skin pigments, also known as melanin. You may be at increased risk for developing dark spots if you’re over 40 and have fair skin. If you spend a lot of time in the sun or frequently use a tanning bed, you may develop more dark spots as you get older. Dark spots are typically just a surface condition that affects your self-confidence but not your health. Dr. Hera can evaluate your dark spots, and if there are any areas of concern, she may recommend further testing to ensure you don’t have skin cancer. What treatments are available for dark spots? At Health and Rejuvenation Center, Dr. Hera uses the state-of-the-art ICON™ laser system to reduce the appearance of dark spots and other skin hyperpigmentations. The laser uses intense pulsed light that targets melanin underneath your skin. A variety of light waves break up the melanin, destroying it permanently without damaging surrounding tissue. Your body naturally eliminates the damaged cells as waste and you begin to see a significant improvement in the appearance of spots. Over time they appear lighter or go away completely. 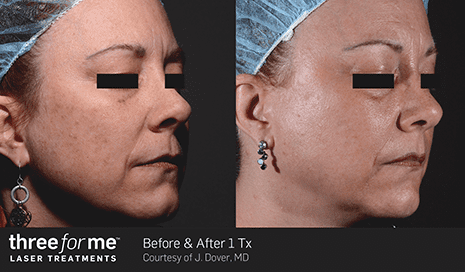 Does the laser system treat other skin flaws? 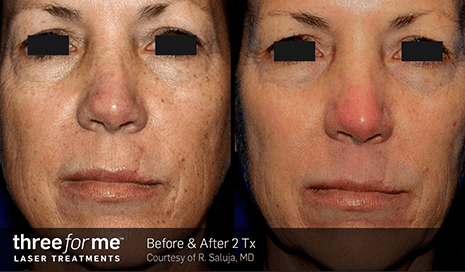 You may see results after the first treatment, with significantly less visible pigmentation of the treatment areas. The noninvasive laser treatments are fast and cause minimal discomfort. Dr. Hera makes sure you are comfortable during the procedure and can apply a topical anesthetic to prevent pain. The laser targets only the melanin in your skin and doesn’t damage surrounding skin tissue. You can expect to return to your normal activities after treatment. You can treat any swelling or discomfort with over-the-counter ibuprofen. To find out if you’re a candidate for ICON laser treatments to minimize dark spots and sun damage, schedule a consultation online or by phone.